First update since 1992ONLY available as software! The last Book Version was done in 1992 for CRC Press (now Taylor & Francis). Many scientists and engineers who work with chemicals spend an inordinate amount of time using a chemical name to identify a more appropriate chemical name, the Chemical Abstract Service (CAS) Registry Number, and/or the chemical structure. Often an individual will start out with a trade name that provides no insight into the chemical identity. One of our colleagues once told us that identifying a chemical often took him four to eight hours. The goal of this book is to make these lookup tasks cost nothing (other than the cost of this software) and take a reasonable amount of time for 95% of the chemicals that most individuals will need. For the remaining chemicals, investigators will have to use the traditional on-line sources, such as CAS On-line's Registry File  (>18,000,000 chemicals), the Chemical Information System's SANSS file  (350,000 chemicals), or the National Library of Medicine's (NLM) ChemID files (over 180,000 chemicals) , and pay the on-line fees. A list of approximately 12,371 chemicals in the Chemical Update System for production year 1985, 1990, and 1994. This contains organic chemicals whose site production exceeds 10,000 lbs/year. A list of approximately 5,000 chemicals from the FATE/EXPOS file . This file contains chemicals that have been monitored in the environment and/or are produced at over 100,000 lbs/year in 1977, the initial year of the TSCA Inventory. The SUPERLIST from the ChemID file of the NLM which contains 5,600 chemicals on "16 lists relevant to SARA Title III, FIFRA, Department of Transportation, Interagency Agency for Research on Cancer (IARC), National Toxicology Program, OSHA, and some of states" . This includes all the chemicals that are in the U.S. EPA's "List of Lists." A list of approximately 4,200 chemicals in the Hazardous Substances Data Bank from the NLM. 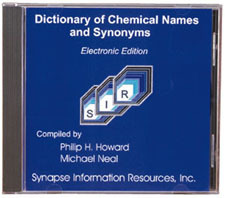 This software has the three main sections from the original book version of Dictionary of Chemical Names and Synonyms with the addition of seven browseable keyword indexes, and full-text search, for immediate data access. This is the primary section in the software version since the Keyword Indexes and/or Search will automatically direct you to the correct base record if, for example, a synonym, molecular or SMILES formula, or CAS number is entered. An index of over 150,000 chemical synonyms arranged in alphabetical order that indicate the corresponding CAS Registry Number. The pages of this section are maintained for your browsing and printing needs. All of the CAS-number references have been converted to hypertext to facilitate jumps to the appropriate base records. Either the Comprehensive or Chemical Synonyms keyword indexes replace the original function provided by this section. An index of chemical formulas ordered by the Hill system (number of carbons, number of hydrogens and then alphabetical by element) that also indicates the corresponding CAS Registry Numbers. The pages of this section are maintained for your browsing and printing needs. All of the CAS-number references have been converted to hypertext to facilitate jumps to appropriate base records. Either the Comprehensive or Chemical Formula keyword indexes replace the original function provided by this section.